Dr Kathryn Simpson, UK Data Service Research Associate at the University of Manchester, discusses the demand for reliable data to examine the broad ranging issues in the EU referendum debate. Find the data you need at the UK Data Service. Kathryn has been sought after during the campaign for her expertise in comparative European politics, political behaviour and public opinion. Her research covers how attitudes to inequality are linked to attitudes to European integration as well as the link between public attitudes to inequality and public attitudes to the European Union in the context of economic crisis. On Thursday 23rd June the British electorate went to the polls to vote in the UK’s second referendum on membership of the European Union (EU). By Friday morning, less than twenty-four hours after the polls had closed the result was conclusive with 51.9% of the electorate voting to leave the EU. The UK would now begin the process of exiting the EU, an organisation and institution of which it had been a member since the first wave of enlargement in 1973. Since the referendum result, the domestic political implications have been unprecedented. The Prime Minister (PM) David Cameron has announced he will resign prompting a leadership contest within the Conservative Party with the aim of having a new PM by autumn. The Labour Party is also facing turmoil as several members of the shadow cabinet have resigned over the Labour Leader Jeremy Corbyn’s performance for the Remain campaign during the referendum. There is also the possibility of a second referendum on Scottish independence as Scotland voted to remain in the EU. Scotland’s First Minister and leader of the Scottish National Party (SNP) Nicola Sturgeon has stated that it is “democratically unacceptable” that Scotland will leave the EU as 62% of the electorate in Scotland voted to remain in the EU. And the Deputy First Minister of Northern Ireland, Sinn Fein’s Martin McGuinness, has called for an all-Ireland vote on unification, a so called ‘border-poll’. All in all an extraordinary time in British politics-and all within 72 hours of the referendum result. The free movement of EU citizens is a fundamental part of EU membership which is outlined under EU law. The Remain campaign argued that EU immigrants pay more taxes than they take out, that immigration is good for the UK economy and under PM Cameron’s renegotiated deal in-work benefits for new EU migrant workers would be limited for the first four years. The Leave campaign argued that it is difficult to control immigration because of the free movement of EU citizens and as a consequence high immigration has driven down wages for British workers. In addition the Leave campaign argued that public services in the UK are under strain as a result of immigration. The UK is not part of the Schengen Area and therefore does not have open borders. Thus the Remain campaign argued Europol membership and the sharing of intelligence helps to combat cross-border crime and that the European Arrest Warrant in particular has returned thousands of criminals to justice in the UK. The Leave campaign refuted this claim stating that the supremacy of EU law makes it harder to deport criminals and that post-Brexit the UK would still cooperate with EU member states to address terrorism. The Remain campaign argued that leaving the EU would cause an economic shock and that growth in the UK economy would be slower. In addition, the UK would still have to apply EU rules in order to have access to the single market. The Leave campaign contested this by stating that UK companies would be exempt from the encumbrance of EU regulation and would be able to negotiate trade deals bilaterally with other countries. In light of the result, and as a consequence of the broad ranging issues in the EU referendum debate, there is a demand for reliable data to examine these topics. Fortunately, the UK Data Service holds many of these data, several of which have featured in the press during the EU referendum debate. These data can also be used for further analysis on various aspects of the debate and for post-Brexit analysis. The European Social Survey is a biennial multi-country survey covering over 30 nations. Its aim is to measure and explain trends in attitudes, beliefs and values across countries in Europe and its close neighbours. Data from the European Social Survey (ESS) has been used to examine how religion has played a role in the EU referendum debate as well as demonstrating that the UK may not be the only EU member state which opposes further European integration. The UK Data Service has European Social Survey data from 2002-2015. The British Election Study (BES) aims to explore the changing determinants of electoral behaviour in contemporary Britain. The surveys have taken place immediately after every general election since 1964. The UK Data Service has all BES data from 1969-present. 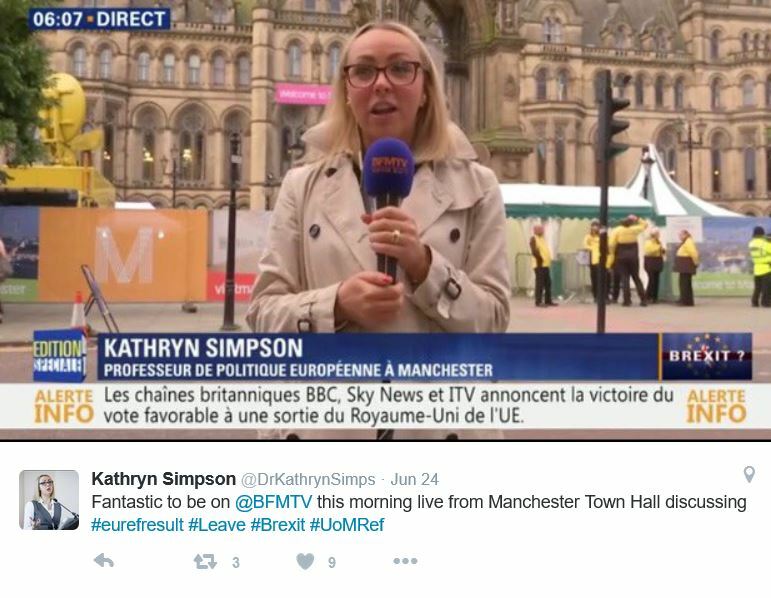 BES data was used on EU referendum night as part of ITV’s referendum night coverage. BES data has been used to cover various topics in the EU referendum debate such as marginal areas and key moments to look out for, how the result will emerge and how divided the UK is over the issue of the EU referendum. The British Social Attitudes Survey is designed to produce annual measures of attitudinal movements to complement information gathered from large-scale government surveys that deal largely with facts and behaviour patterns, and party political attitudes data produced by the polls. The UK Data Service has BSA data from 1983-present. Data from the BSA has been examined in order to understand attitudes towards an anti-immigrant mind-set, voting intention in the EU referendum, attitudes towards Higher Education in the UK post-Brexit, and the differences between graduates and non-graduates and their attitudes towards the EU. The Annual Population Survey (APS) began in 2004 and aims to provide data that can produce reliable estimates at local authority level. Key topics covered in the survey include education, employment, health and ethnicity. The UK Data Service has APS data from 2004-present. Data from the APS has been used to answer questions on immigration, the impact of the Big Bang enlargement of 2004 on the UK population and how immigration has impacted different regions in the UK. The Labour Force Survey (LFS) is a unique source of articulated information using international definitions of employment and unemployment and economic inactivity, together with a wide range of related topics such as occupation, training, hours of work and personal characteristics of household members aged 16 years and over. The UK Data Service has LFS data from 1975-present. Data from the LFS has examined issues such as employment and unemployment rates, immigration, implications for part-time and temporary workers post-Brexit and migrant jobs. The population census is a vital resource for social scientific research and policy development, providing a snapshot of demographic and social life in the UK that helps inform government policy at local and central level. The UK Data Service has a variety of census data; aggregate, flow, microdata and boundary data from 1971 to the full UK census for 2011. Census data has been used to examine the generation gap in the EU referendum result as well as implications for EU citizenship. The Northern Ireland Labour Force Survey series comprises annual datasets that are Northern Ireland subsets compiled from the main United Kingdom Labour Force Survey (LFS). Topics cover include: information about household, family structure, basic housing information and demographic details of individuals in the households, economic activity, income, education and health. Data from the Northern Ireland Labour Force survey have examined issues such as welfare, EU workers and the labour market. Read our Storify looking back on the use of data in the UK Data Service collection focused on the campaigns around the EU Referendum. David Cameron agreed a package of changes to the UK’s membership of the EU with other member states’ leaders in Brussels in February. These included changes to child benefit, migrant welfare, Eurozone, sovereignty & free movement. The Schengen Area has abolished passport and any other type of border control. It functions as a single country for international travel purposes, with a common visa policy. Countries in the Schengen Area have eliminated border controls with the other Schengen members and strengthened border controls with non-Schengen states. A very useful summary, thank you!